The last recipe from my Easter barbecue is really more of an update. Or rather, more of an update in technique. 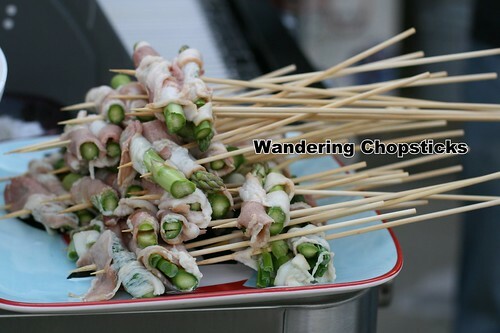 I've blogged Bacon-Wrapped Asparagus before, but grabbing bacon-wrapped anything can be a bit greasy. Obviously, with chicken and ribs on the menu, hands were already going to get greasy, but I wanted to wrap the bacon around each asparagus spear and then skewer them like I've seen the chefs do at Shin-Sen-Gumi Yakitori-Shabu Shabu - Monterey Park. Luckily, the older '88 showed up just in time to help me finish prepping. 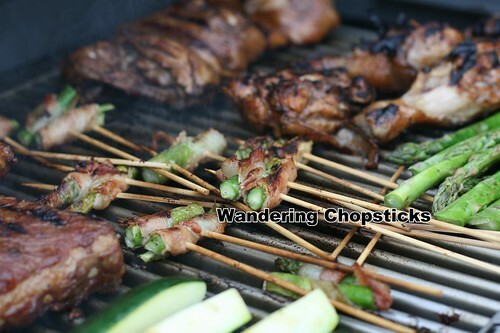 I tried wrapping bacon around an asparagus spear and scallion, and while tasty, it was more difficult to make it look nice. The bacon didn't go as far as I thought. Despite using a pound of bacon and making a giant platter, these pretty much all disappeared by the end of the evening. 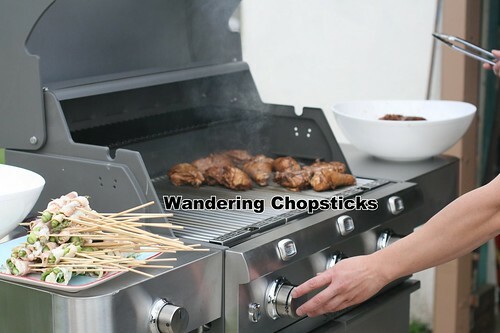 Obviously, you'll also need a bunch of bamboo skewers. 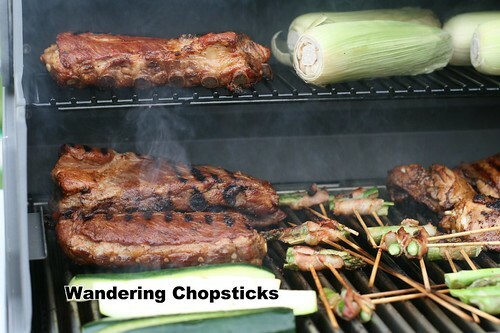 Make sure you soak them in water before using so they won't burn on the grill. Snap asparagus close to the bottom of the spear. It'll naturally break off where it gets woody. Discard the tough bottoms. Then wrap a slice of bacon around each spear. See? I told you my cousin wrapped a big platter! 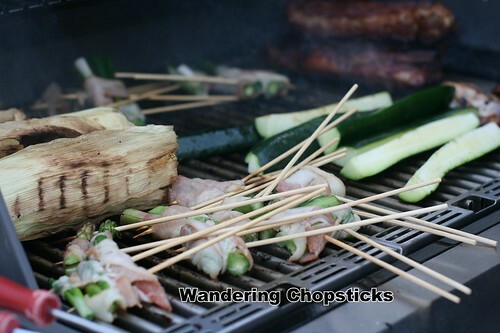 So basically wrap bacon around an asparagus spear, then line them up in twos at opposite ends (that way, you don't get a piece that's just bottoms or just tops), and skewer them every few inches are so. You can get about three skewers out of each spear, so visually divide the sections with your eyes. 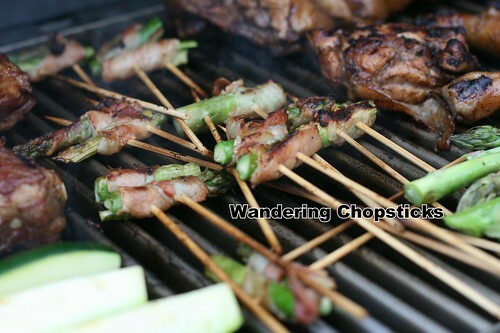 Then, make sure you have two skewers for each section so that the bundles will stay together on the grill. 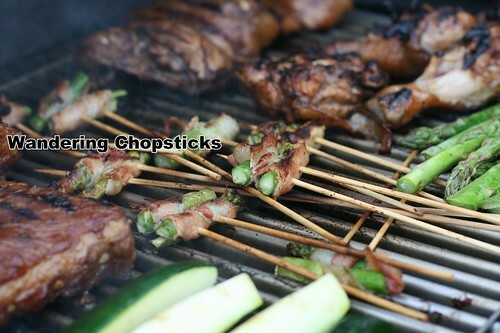 So you'll have six skewers total. Then slice the bundles, separating each section. I realize I didn't do my usual step-by-step phototaking, but I was busy making Spicy Macaroni and Cheese and my cousin finished prepping the whole platter before I even realized it. I'm not gonna complain when the older '88 does such a good job helping me! Bacon is already salty, but you can very, very lightly sprinkle on a mix of salt and pepper if you'd like. 3 years ago today, Fleur De Lys Patisserie - Monterey Park (Closed). 4 years ago today, The Huntington Library, Art Collections, and Botanical Gardens (Japanese Garden) (Spring) - San Marino. 5 years ago today, I finally wrote my About & FAQs page. 6 years ago today, dainty little Cucumber Sandwiches. That looks so good! I'll have to try this sometime! Very pretty presentation. I have a recipe that is a bit deconstructed in that it's done on the stovetop. There's lemon zest and a bit of parsley to brighten the flavors quite nicely. It's so simple, but super popular. Oooh, lemon zest and parsley would be lovely. I wonder how I could incorporate that into skewers? Maybe dust the bacon with it before wrapping around the asparagus? That gives me some ideas!